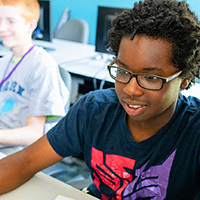 DigiPen Academy provides elementary through high school students with a uniquely engaging learning environment, where teachers challenge everyone to excel as individuals and thrive as part of a team. Our exploratory and preparatory level classes are held four days each week. Families may choose to take as few or as many courses as needed to meet their student’s learning goals. We still have room in our May Programs! Register Now. 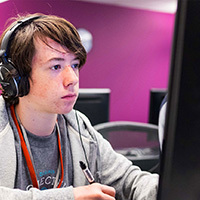 This is a great opportunity for students to take advanced classes in computer science, art, or sound design and earn Advanced Placement* credit or college credit at DigiPen. Students gain exposure to a collegiate environment and have access to opportunities like college mentoring and shadowing. 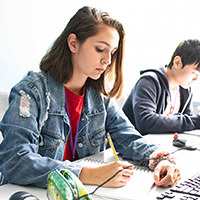 Online Programs are perfect for students who can’t travel to DigiPen’s campus or who would like to learn about video game programming, art and animation, and game design from home, these courses combine rigorous curriculum with hands-on projects to give students valuable experience. Through partner locations, DigiPen offers a variety of classes at learning institutions around Washington State and beyond.These off-site programs are perfect for students who can’t make it to DigiPen’s Redmond campus or who want to pursue lengthier technology programs close to home. Register now for WANIC (Washington Network for Innovative Careers). To find out more about WANIC or any of the other tech centers in Washington State please visit the WANIC website.